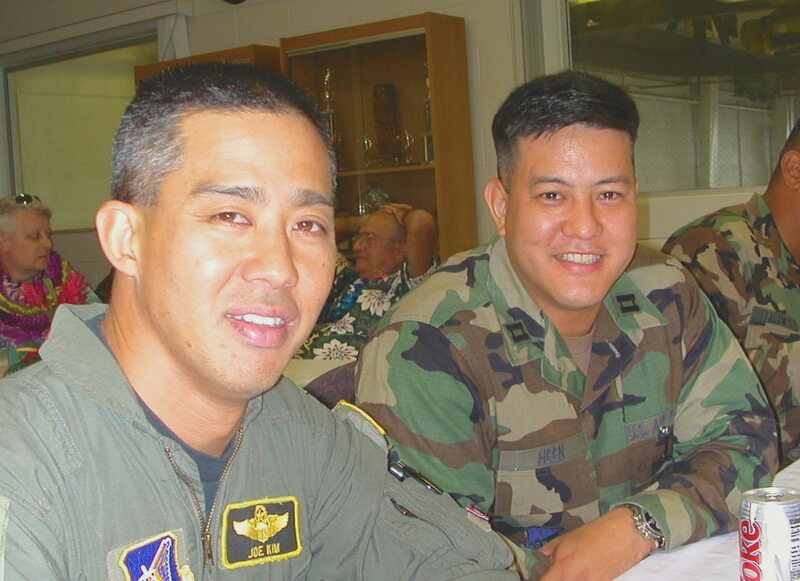 This undated photograph shows a young Joseph Kim and Cliff Heen. In the background is a lei bedecked Mick Melich, but we are unsure if this was his pinning celebration in 1997, or retirement party in the early 2000s. An Air Force Academy graduate, Joe served several years in the Air Force before joining the newly formed 203rd Air Refueling Squadron. He went on to serve in key staff positions before becoming the 154th Wing Commander. He later served as the Deputy Adjutant General until his military retirement. Before leaving State service, he served as the Deputy Director of the Tax Department. Cliff served in the 154th Wing before leaving at mid-career to work for Young Brothers. His current status is not known.